A shirtless man is fondling a brass puzzle box whose idea of “No means no” involves spewing out flesh-piercing chains. The attic room he occupied fils with dangling hooks and spinning pillars adorned with flesh. The man, who we will soon learn goes by the name Frank Cotton, is reduced to a few gallons of blood soaking the woodwork, his face strewn about the room in chunks. Another man steps out of the dark. He is dressed in leather that stylishly draws attention to his various abdominal wounds. He is almost a silhoutte, but the light drifting down over the back of his hairless, ghost white flesh exposes a grid carved into his head, with a pin hammered into his skull at each intersecting line. 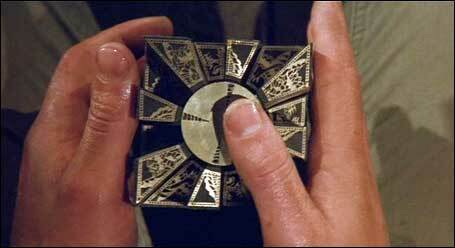 He places the chunks of Frank’s mutilated face back together, in a jigsaw, and caresses the surface of the box. In a flash, all the chains and gore are gone, leaving the room as barren as if nobody was ever there. In Short: Hirokazu Kore-eda’s Still Walking is a film that is very familiar, with themes and emotions that have been covered well by many previous films, perhaps most closely reminiscent of Yasujiro Ozu’s masterpiece Tokyo Story. One could say that it’s been done before, but that doesn’t stop Still Walking from being an enormously touching and well crafted film that ranks among the best of the past few years.